This lifestyle grazing property is located on the edge of town on a 35.6 acre gently sloping block. With top class improvements, this property has a near new, master built, 4 bedroom brick home. Main bedroom has an ensuite and walk-in-robe, a well appointed modern New Guinea Rosewood kitchen with gas range, spacious lounge with reverse cycle air conditioning and combustion heater, separate dining room and verandahs which overlook this spectacular property. 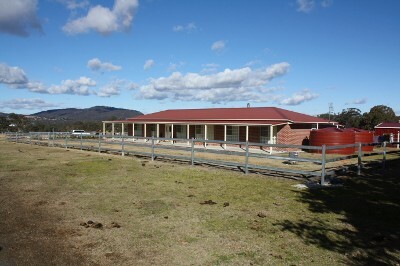 Outside, structural improvements include a 12m x 9m colorbond American style barn with 2 stables and tack room, 9m x 9m colorbond shed with 3m x 3m cold room and a 9m x 7m colorbond shed. This property is well fenced with fully netted steel fencing around the home and the remainder electric. There is a 2x 6000 gallon and 2x 5500 gallon poly water tanks with 3 electric pressure pumps on the property that provide ample water distribution and stockyards with a head bail. Surrounded by 350 chestnut trees, rarely do these well improved properties handy to town become available. Take advantage of this opportunity and inspect this property today. Prepare to be dazzled!